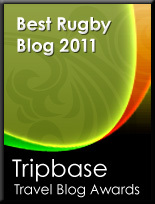 TOTAL FLANKER...a rugby blog: Time to relax? With both Fiji and Tonga making it through to the semi finals of the Rugby League World Cup, it is being suggested in various circles that perhaps Rugby Union should follow Rugby League's example in relaxing international eligibility rules. A recent change to the eligibility rules in League has meant that players who were not selected by a tier-one team can now switch allegiances to another team for whom they qualify, resulting in a number of top quality NRL players now turning out for Pacific Island teams. Clearly this policy has worked for League but then again it desperately needed to find ways of evening out the competition for the Rugby League World Cup to make the tournament credible. Union doesn't face quite the same credibility issue, but there's little doubt that, as a short-term measure, for the Rugby World Cup a similar eligibility policy would make the tournament more competitive than it currently is. Whether it could work in general, however, is more debatable. To ensure fairness across the board the new rules would need to be open to everyone and would no doubt be open to abuse - with economic factors playing a prominent part. Opening up eligibility also flies in the face of recent measures introduced to tighten international eligibility rules. If you think that national teams picking foreign-born players is controversial now, imagine the furore when a player decides to switch international allegiance purely for a better pay packet. No, for me the "Rugby League solution" is merely the equivalent of putting a sticking plaster on a gaping wound. Tinkering with eligibility rules will not solve international rugby's widening inequality gap - which can only be settled by World Rugby and the so-called "Tier One" nations addressing how the game's wealth can be more equitably distributed.